Silicon was discovered in 1824 by J.J. Berzelius in Stockholm, Sweden. After carbon, silcon is the most abundant element on earth, the abundance being 277,000 ppm. It is generally present as a silicate, these being found in many rocks, clays and soils. 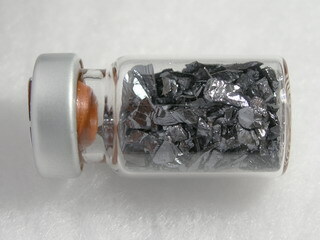 Silicon is obtained by reducing silica (sand, SiO2), with carbon. Further purification of the element for applications requiring high purity material (e.g. semi conductor devices) is achieved by zone refining, the resulting purity being better than 1:109. 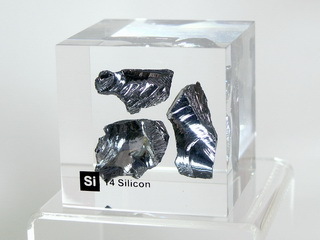 Silicon exists in two allotropic forms; brown silicon is a powder, whereas crystalline (metallic) silicon is grey and it is the latter which is more widely used. Bulk silicon is unreactive towards oxygen, water, acids (excluding HF), but is soluble in hot alkalis. Silicon has many applications in various industries; for example, ultra high purity silicon is used in the semiconductor industry as a result of its semiconducting properties. 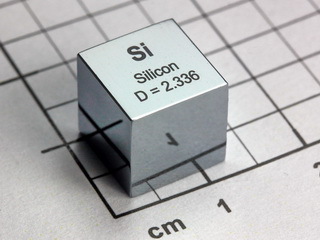 Silicon is also used as an alloying element in the manufacture of certain alloys (e.g. ferrosilicon, an alloy of iron and silicon which is used to introduce silicon into steel and cast iron). 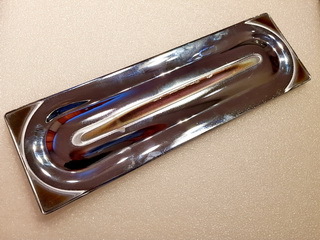 It is also used in the manufacture of glass.